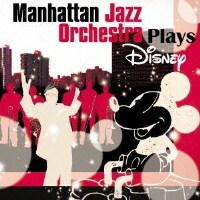 Description: Manhattan Jazz Orchestra was created by pianist/arranger David Matthews and an accomplished Japanese producer Shigeyuki Kawashima (both GRAMMY winners) in 1989. It is one of the premier and most prolific big bands in the US, having released 15 CDs over the last 22 years. MJO follows their massively successful Sing Sing Sing 2010 - Tribute To Benny Goodman with a surprising Disney tribute, Plays Disney. Seasoned jazz fans will remember classic Disney albums by such jazz musicians as Louis Armstrong and Dave Brubeck. Well, this ain't nothing like them! First of all, the selections are decidedly post-1980s, including music from recent Disney hits Pirates of the Caribbean, Beauty and the Beast and Lion King. Secondly, the arrangements by David Matthews are hyper-modern. Even older tunes like "Chim Chim Cher-ee" and "Alice In Wonderland" are transformed with intricate lines and kinetic energy. As usual, the daring and creative and arrangements by Matthews are awe-inspiring, and the execution of his score by the top-notch New York musicians is impeccable and vibrant. Recommended to fans of big band music! Produced by Shigeyuki Kawashima. Recorded at Sear Sound Studio, New York, on March 27 and 28, 2012.